Scythe is a story about Citra and Rowan, two young people living in a world that the current world can only dream of – no illness, no sickness and no death. It sounds like a perfect world, but without death there would be an over-population issue, and to overcome this issue there are those responsible with delivering death: Scythes. Scythes are the bringers of death. They are highly skilled assassins, and only they are charged with the ability to take away someone life. This is understood and accepted by the whole society, and whilst being “gleaned” is not something that anyone wants, the best people to conduct this act are the ones who want to do it the least. Citra and Rowan have no interest in becoming Scythes, but they are chosen to become apprentices because they have no desire to do so. However only one apprentice will be ultimately become a fully-fledged Scthye. This in itself creates some moral dilemmas; however it is the overall structure of the Scythedom that had me intrigued from the very beginning. You would think with such a system as Scythes and gleaning that there would be a long list of rules and a very strict structure. However, that does not seem to be the case at all. There are rules in place to ensure numbers of gleanings are reflective of requirements, and stipulations and checks to ensure that Scythes don’t glean too heavily based on race, gender, soco-economical status etc, but the manner of which a Scythe gleans is primarily up the individual Scythe. This aspect is what I found fascinating. One may expect that a good Scythe is someone who does not have too much emotion. I mean, afterall, to kill for a profession it must be beneficial to not have a moral conflict about ending someone’s life. However this book actually emphasises that those who want to do so the least are the best people to have the ability to take away someone’s life. There are quotas as such, to ensure population levels are kept within control as well as checks to ensure that Scythes are not being prejudiced in their choices of victims, however the manner in which they choose their victims and execute the task is completely up to the individual Scythe. During the story we get to see a few different Scythes with varying ways in how they choose and end the life of their victim, and I found this intriguing. I actually really enjoyed one Scythe in particular, the honoured Scythe Faraday who takes Citra and Rowan on as apprentices. I found him utterly fascinating and morally just. Not say I didn’t like other Scythes (but there were some I certainly did not), I just had a soft spot for Faraday. And while I did not absolutely adore our main characters Citra and Rowan, I did really enjoy both their journeys and their own inner turmoils. In this world Scythedom is revered to the point of nearly being a deity, however it does carry a very heavy burden. No one can resist or hurt a Scythe, so there is no risk of being harmed while conducting their duties, however it is the torment of the job that is the real risk. Who would want to take this on? Certainly not Citra or Rowan. However they find themselves in an apprenticeship to become something they never wanted to be. Both apprentices start out somewhat hesitantly but quickly find themselves wanting to do the best they possibly can during their apprenticeship. However the stakes soon get raised, and the story goes in whole new direction. Along with this interesting world, there were a few twists that keeps the storyline really propelling forward. The twists were unpredictable, and not only did I enjoy the unexpected turn of events, but I really enjoyed where they then took the storyline and our two main characters. In a world where death is small chance rather than a certainty, there is a real risk of becoming detached from the joys and pain of life. 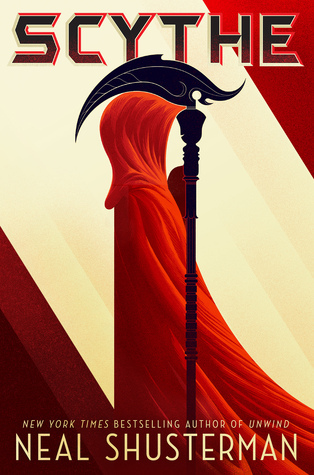 Scythe brings this to the forefront and really focuses on the morality of this dystopian world where life is guaranteed without the risk of oppression, discrimination, desperation, illness – even death is not a risk unless it is delivered by a Scythe. Obviously this is a story about death and killing, so yes, there is blood and gore in involved. However I did not find that it overtook the storyline. There certainly was gratuitous death/violence, but it was well within the storyline and did not seem excessive considering the purpose of story/arc. Mainly I loved the morality (or lack of) and I enjoyed seeing how this sacred job affected those within it and I really enjoyed the exploration of ethics both within and outside of the Scythedom. And due to the clever twists involved, I cannot wait to see where the story goes from here!